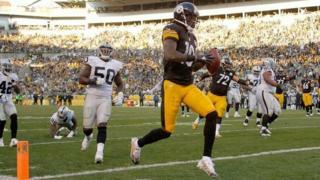 Watch the best action from week nine of the NFL season as Pittsburgh Steelers wide receiver Martavis Bryant avoids three tackles to score a touchdown. Also featured is Delanie Walker of the Tennessee Titans who takes advantage of a defensive mix-up to score a 61-yard deflected touchdown while Omar Bolden runs in an 84-yard punt return for Denver. It was also a rollercoaster week for Dallas quarterback Matt Cassel against Philadelphia as Jordan Hicks scored from an interception but he connected with Dez Bryant for a superb 18-yard touchdown. You can watch the best of the action from week nine of the NFL in Race to Super Bowl 50 on BBC Two at 00:15 GMT on Wednesday November 11.